TO YOU THIS WONDERFUL PACKAGE! Fairy tales can come true they can happen to you with Herzerl Tours (The Roeders, Janueary 2018). Susannne..Connie and I would like to thank you for the wonderful trip. 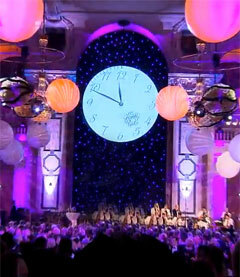 The Sylvester ball, performances and venues were perfect. We both gained 5 pounds on the great food. We especially would like you to extend our appreciation to two special guides, Irene and Leopold. Irene braved the cold and blowing snow to provide us with a walking tour of downtown. She is so knowledgable of her city and so friendly. We were so happy with the Vienna Woods tour that Leopold showed us. Susanne..our most sincere thanks for a magical vacation - the Kaiserball was an overwhelming success. 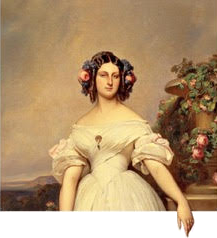 The hotel Johan Strauss was perfect. Excellent location, close to the metro. The most wonderful breakfast we have ever had in an European Hotel. Staff was extremely helpful. Your choice of restaurants was excellent. Quality and ambiance. Wonderful settings and excellent meals.I don't know how you did it, but we had the best seats in the house, or palace, for the Kaiser Ball, Directly on the dance floor near the main entrance, and elevated. Clearly we were the envy of all those in attendance. First row for Die Fledermaus was not too shabby either. Our week in Vienna was everything we had hoped it would be and the highlight of the week, the New Year's Eve Imperial Ball in the Hofburg Palace, was a truly magical evening. Herzerl Tours did a most professional job in planning our vacation and packed it with a lifetime of memories. Thank you, Suzanne, for the personal attention you gave us. We are so grateful for having discovered you and have recommended Herzerl Tours to everyone with whom we have shared our experience." 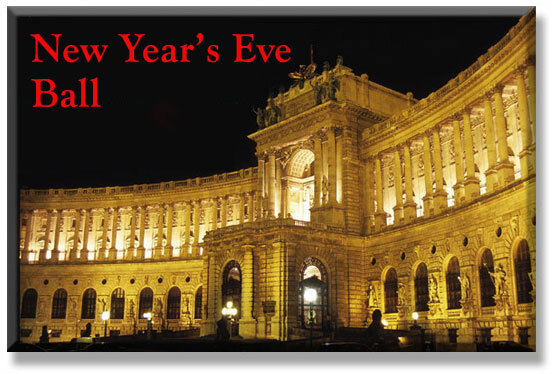 If you ever had a dream to celebrate a very special New Year's Eve in truly royal splendor, then this is for you. 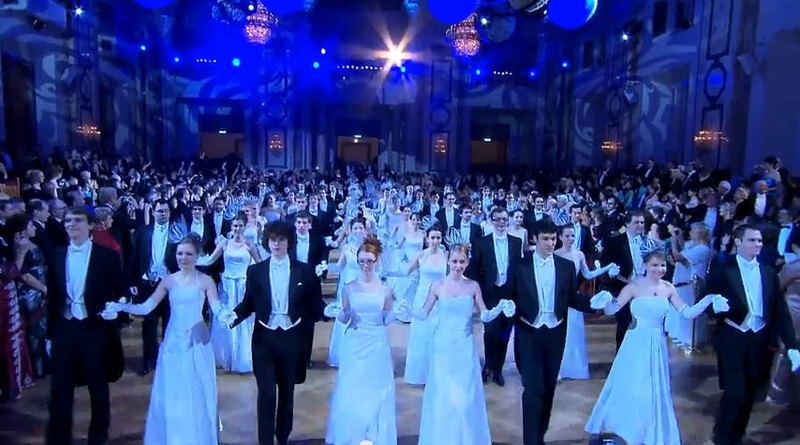 First, Waltz lessons in Vienna's most renowned dancing school, then the New Year's Eve Ball "Hofburg Ball" at the Imperial Palace (the winter residence of the Habsburgs) - swaying to the strains of Johann Strauss' waltz music in the arms of your prince or princess. A once-in-a-lifetime experience! The Price for the package as shown below in a Viennese four star hotel, land only, is $7,500.00 per couple in a double room. "Hall of Ceremonies" in the Imperial Palace. your special week in Vienna. 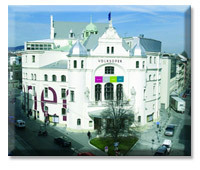 Depart from US airport of your choice for your wonderful romantic adventure in Vienna. 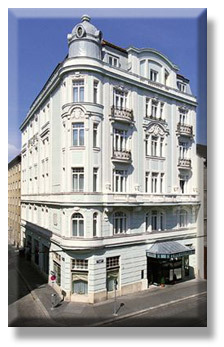 Arrival at Vienna Airport, Schwechat, and transfer with private car to Hotel Johann Strauss* or similar. The hotel is located in walking distance from the Inner City and close to public transportation. 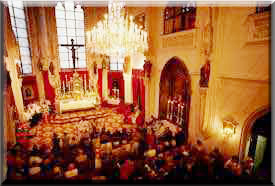 3:30 PM your private guide will pick you up at the hotel for your first experience in Vienna - a walking tour through the Inner City, passing Vienna's famous Gothic landmark, St. Stephen's Cathedral, (guide will point out locations for the program of the next days), ending up at your dinner. 6:00 PM Welcome Dinner at the renown Restaurant "Griechenbeisl", Vienna's oldest restaurant since 1447, located in the untouched medieval quarters of Vienna. After a traditionally Viennese dinner you will venture back to the hotel using your newly acquired city knowledge and the "U-Bahn", Vienna's modern subway. 12:00 noon . you can stroll from the palace to the famous Hotel Sacher and visit the Blaue Bar for Hors D’Oeuvres and a glass of the “bubbly”. 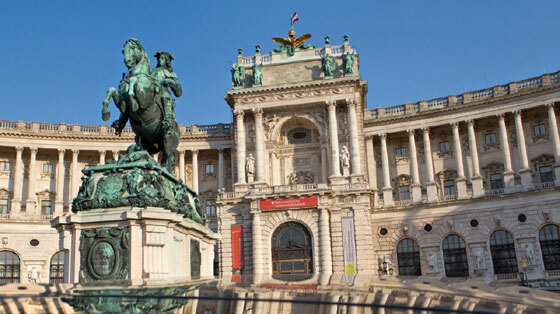 9:00 AM pick up at hotel for city sightseeing tour by regular coach including the famous Ringstrasse and its elaborate palatial buildings and a visit to Schönbrunn Palace, the Habsburg summer residence. 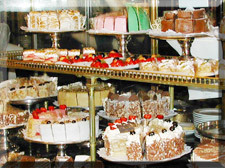 There will be a lunch at the Cafe Residenz on the palace grounds followed by Apple Strudel Show, must then take public transportation back to hotel. 7:00 PM (optional – extra charge for tickets) Possibility to attend a performance of the famous Lipizzan horses at the Spanish Riding School (Imperial Stables). Evening Dinner on your own. This day is free at leisure and relaxing before the big event - or to visit one of Vienna's many marvelous museums or go shopping on elegant "Kärntner Strasse"! Buy yourself something wonderful like a piece of Augarten porcelain or a piece of crystal at world famous Swarovski. 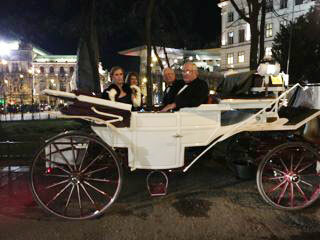 6;30 PM pick up by a horse drawn carriage from the hotel to the Imperial Palace (Hofburg), the former winter residence of the Austrian Emperors. 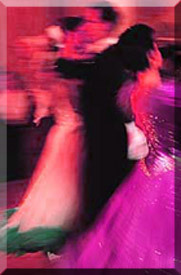 7:00 PM PM as you enter you start feeling like a different person - the elegance of the palace; the Imperial Guards greeting the guests; women in long dresses and men in tuxedos or tails, swaying to the music of a Strauss waltz - in the same place where royalty used to dance. Your reserved seats are at a table in one of the spectacular halls, dinner including beverages will be served to you there in Imperial style. And of course you dance and dance and dance. HAPPY NEW YEAR! 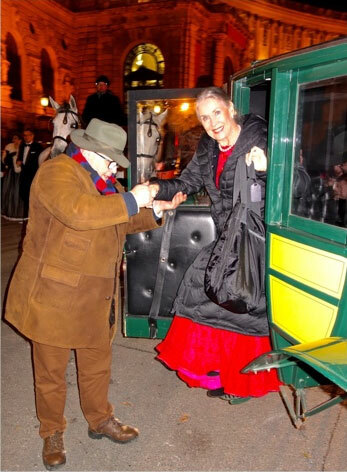 PROSIT NEUJAHR!Return to the hotel by taxi or in your magic pumpkin. 11:00 noon - 3:00 PM You may want to stroll through the Inner city to your brunch or take a Viennese tram (street car) along the Ring. The Brunch at Hotel Intercontinental's MediterraNeo - an elaborate buffet prepared by a famous Chef incl a special aperitif and possibility to watch and hear a transmission of the famous Vienna Philharmonic New Year's Concert on gigantic screen television. 7:00 PM To end this wonderful first day of 2020 you will attend this age-old Viennese tradition - a performance of Johann Strauss "Fledermaus" - (flitter mouse) at one of Vienna's major opera houses "Volksoper". 7:00PM - Your final culinary experience is at Restaurant Do &Co, located on St Stephens Square. The Do & Co Restaurant is located on the top floor of the hotel and there is no place more beautiful to relish life. 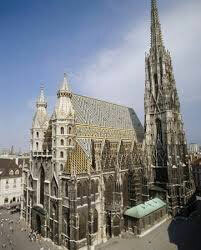 The backdrop of Vienna´s St. Stephenâ€™s cathedral and the culinary presentation seduce at highest standards. Transfer with private car from Hotel to Vienna Airport. The above program is offered by Herzerl Tours Division of Omnific Assoc., Inc. for the New Year 2019/2020 . Upon request arrangements for superior four star or five star hotels at an increased price can be made. Above package includes ball tickets for CAT I (Festival Hall); for CAT II tickets (Hall of Ceremonies) decrease the price by $200.00.00 per couple. remaining balance (plus additional services client may add on) is due by September 20, 2019 Herzerl Tours can arrange your airline tickets if you so desire. Please make all checks out to Herzerl Tours & mail to PO Box 217, Tuckahoe, NY 10707. WE CAN ARRANCE PAYMENT WITH CERTAIN CREDIT CARDS- ADD'L FEES APPLY . *The price is based on the current exchange rate of the Euro vs. the Dollar (Jan. 2019) i.e. any drastic cost increases caused by a weakening dollar shall have to be passed along to client.